“Do whatever you want, as long as it doesn’t hurt anyone.” You’ve heard this before, haven’t you? Have you ever thought about the consequences of your decisions? People tend to forget that everything they do, is going to have an impact on the world, on the environment around them. It might seem to be unimportant when you stir your fancy drink with the plastic straw, drink the last sip and put your glass back on the table. Have you ever wondered what happens to that straw afterwards? In order to understand the environmental impact of straws, it is important to know the difference between biodegrading and degrading: biodegrading means that an item can be naturally broken down and digested by micro-organisms and naturally recycled into new molecules and life. Degrading only means the process of breaking down to smaller pieces, so small that they become invisible, but never really disappear from the Earth. Plastic straws take up to 200 years to degrade, but they will always stay on this planet, even if we can’t see them. Even worse, the degrading process of plastic, releases toxic chemicals that harm the environment and wildlife. 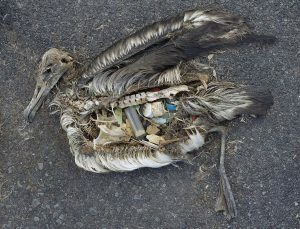 Seabirds are not the only species in danger. Turtles, whales and fish can also easily swallow plastic that float in the water. Take for example this video that shows researchers remove a plastic straw that had been embedded in the nostril of a sea turtle. How would you feel if you’d known that YOU are the one who used the straw that hurt this turtle? Wake up people! We are killing our planet with our negligent behaviour, when all we need to do is be more aware of the impact of our decisions. Say no to plastic and try to replace all the single use items with natural ones. This entry was posted in Sustainable Development and tagged noplastic, protectanimals, saveourseas, savetheworld. Bookmark the permalink. ← KEEP CALM & CLEAN THE BEACHES!